Nearly 2000sf, 3 Bedroom, 2 Bath Doublewide on nearly 5 acres located within 5 miles of Clarkson. Open floor plan, kitchen island, all appliances, fireplace, family room and separate living room with newer carpet. Large deck on rear, landscaped, in well maintained, quiet area within 25 min Elizabethtown. Direction: WK Pkwy W to Clarkson exit. TL on Hwy 224, go 1.5 miles, TR on Rock Creek or Hwy 3210, TL on Alexis. 454 Alexis Blvd, Clarkson KY 42726 is a Home, with 3 bedrooms which is recently sold, it has 1,920 sqft, 0 sized lot, and None parking. A comparable Home, has 3 bedrooms and 2.5 baths, it was built in and is located at 600 Whispering Pine Cir Clarkson KY 42726 and for sale by its owner at $ 82,900. 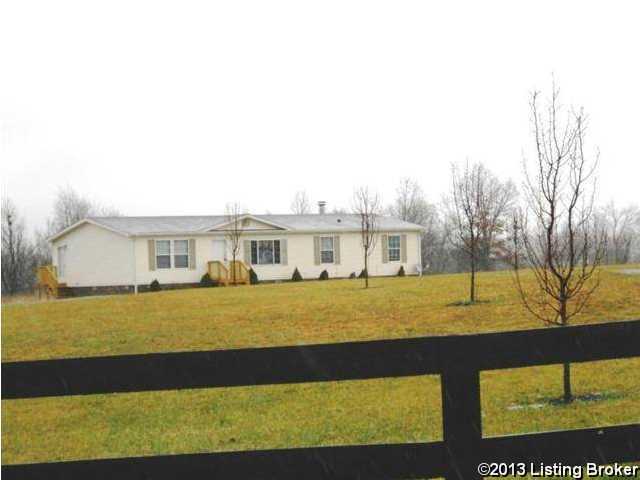 This home is located in the city of Clarkson , in zip code 42726, this Grayson County Home, it is in the NONE Subdivision, and PLEASANT HILL ESTATES are nearby neighborhoods.